Often a circuit requires a 5v DC supply to power some logic circuits. The conventional method is to use an AC wall adapter. But, many systems, which bring AC power onto a circuit board, need a small AC to DC power supply right on the circuit board. The circuit below provides such a supply. It uses a classic series capacitor charge pump which acts as a current limiting device. A full wave rectifier, a filter capacitor and a zener diode provide an off-the-shelf isolated DC to DC converter with a 24v DC input. 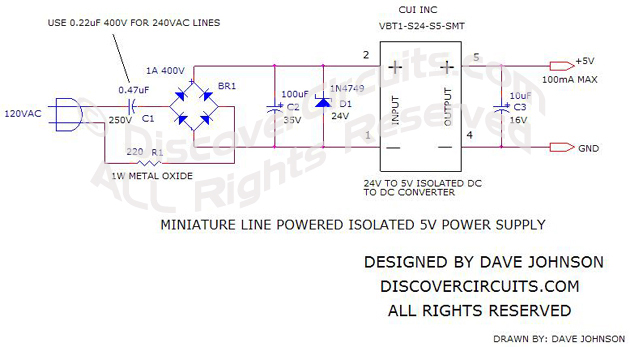 The miniature converter from CUI generates a regulated +5v output, rated at 100ma. By doubling the size of the capacitor C1 the circuit can be pushed to produce 200ma of output current. Also, the same front end circuit can be used with other CUI converters. They sell 3.3v, 12v and 15v supplies as well as the 5v unit shown.